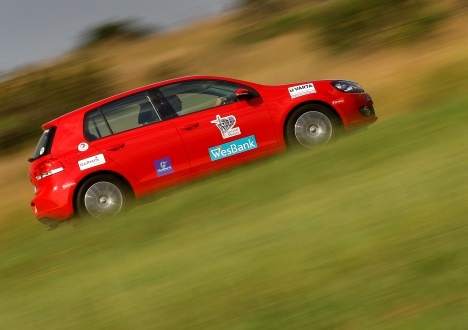 Johannesburg - The South African Guild of Motoring Journalists (SAGMJ) announced the VW Golf 1.4 TSI as South Africa’s 2010 Car of the Year (COTY) at a gala banquet at Gallagher Convention Centre, Midrand, on Thursday. The announcement of the prestigious accolade comes after a stringent process of voting and physical testing of eligible cars launched onto the SA market from 1 November 2008 and 31 October 2009. An in-depth poll of the SAGMJ full members, followed by a second vote by the COTY jury, arrived at eight finalists towards the end of last year. The COTY jury, made up of the top motoring journalists in the country, then put the finalists through two days of testing in February and subjected them to a rigid scoring process. The final audited scores showed VW Golf 1.4 TSI as the eventual winner of what is widely considered to be the most prestigious accolade in the motor industry. The SAGMJ, a professional body of qualified motoring writers, has annually awarded the title of SA’s Car of the Year for 25 years. The VW Golf 1.4 TSI beat off strong competition from the Alfa Romeo MiTo 1.4 Turbo, Audi Q5 2.0T S tronic, Chevrolet Cruze 1.8 LS, Hyundai i20 1.6 GLS, Suzuki Alto 1.0 GLS, Toyota Prius 1.8 ECVT Advanced and Volvo's XC60 3.0T Geartronic which were the other finalists vying for honours in the country’s premier motoring event. By definition, the SA Car of the Year should evoke automotive passion and excitement to make it a truly outstanding car both in its class and in the whole market. The COTY competition is about automotive excellence and the winning car must score highly in its class across a variety of categories including those which reflect value for money, safety, dynamics, technology and aesthetics. It should also demonstrate that it strives towards representing innovation and ingenuity in marketing and engineering in its class and should represent a brave step forward in motoring, preferably setting new benchmarks in its market segment. The winner must show that is truly worthy of the ultimate accolade and the singular title of ‘The South African Car of the Year’.